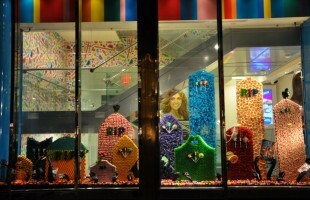 Dylan’s Candy Bar is a chain of boutique candy shops and candy supplier. It is owned by Dylan Lauren, daughter of Ralph Lauren. 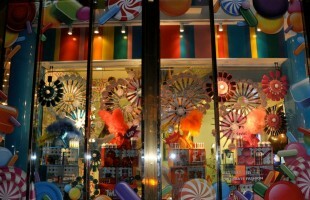 Lauren was inspired to create the store, which is asserted to be the “largest unique candy store in the world”, by the Roald Dahl story of Willy Wonka & the Chocolate Factory. 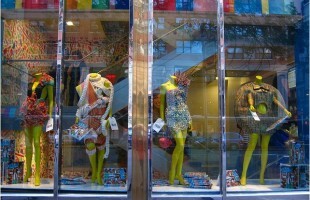 Dobbins & Wright Creative created a window display with the products of Tigi Bedhead and candy of Dylan’s Candybar for Fashions Night Out. 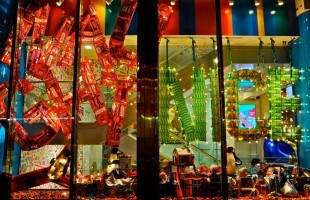 Dobbins & Wright Creative created a ‘Naughty and Nice’ Holiday Window Display for Dylan’s Candybar. Students of the Savannah College of Art and Design created dresses with the candy of Dylan’s Candybar.